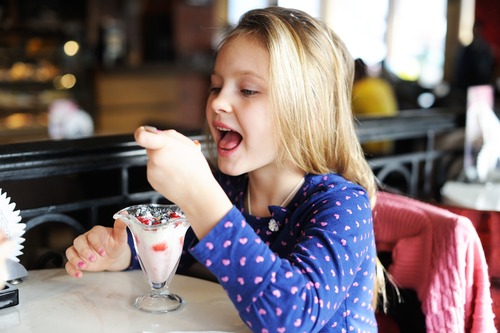 Kids and ice cream are inseparably linked in the minds of the average consumer. Most ice cream shop owners know that children are the driving force behind an ice cream establishment's ultimate success. Without at least a few shop elements that appeal directly to children, an ice cream shop may have a hard time getting customers in the door. It's not hard to appeal to children with an ice cream shop. The words "ice cream" are usually all that is required to get kids excited. However, you can please kids even more by using just a few of these kid-friendly ideas. Bright colors in your décor are a great way to appeal to a younger generation of ice cream lovers. Kids love bright colors, and it has been suggested that bright colors may be appetite enhancers. This is a plus when you own and operate an ice cream store. Fill your walls with bold colors to make the kids feel comfortable and hungry. Don't be afraid to get creative with the ice cream flavors featured on your menu. Flavors like bubblegum and cotton candy may sound strange to adult ears, but kids go crazy for the strange and unique. You can even give flavors creative names that use famous children's literature characters or funny words and phrases. Many kids choose ice cream flavors based solely on color and appearance, too, so don't forget to consider the look of your ice cream when advertising the finished product. Another great way to make lifelong fans out of the children who visit your ice cream shop is to let them use their creative energy to make their own ice cream concoctions. Kids have a very different idea of what tastes good or appeals to them than adults. Many ice cream shop owners might turn their noses up at the idea of letting kids choose flavors and toppings for their finished ice cream product. Remember, though, that kids don't need to sample gourmet flavor combinations in order to be happy. All a child cares about at an ice cream shop is the thought that he or she is going to receive a delicious creamy treat in a matter of seconds. You might not like the flavor combos that kids come up with, but children will be delighted at the freedom and creative control they have over their own dishes. Children are extraordinarily important to the success or failure of an ice cream shop. While many of your customers will be adults, it is the children who often put the idea of buying an ice cream into the minds of their parents. Kids will keep your ice cream shop in business, so it is important to cater to their needs and desires when you are designing the theme, décor, menu, and operation of your ice cream shop. Incorporating just a few of these child-oriented elements will dramatically increase the positive reactions you receive from your "pint-sized" customers.